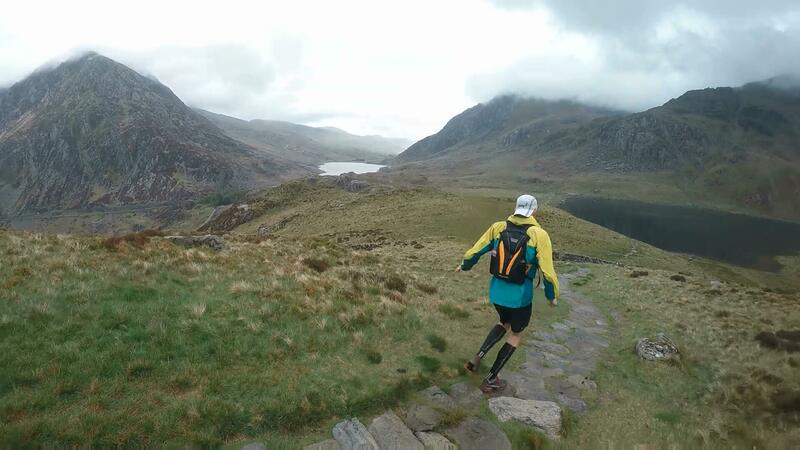 Apart from running a lap around the Snowdon massif, during the Snowdon Marathon, Mike hadn’t visited Snowdonia before. Here is his story of an adventurous weekend in the mountains. Kids climb this all the time you say? This is basically falling forwards and catching myself. Just some of the quotes I came out with whilst clinging onto the edge of Crib Goch whilst on the approach to the summit of Snowdon. 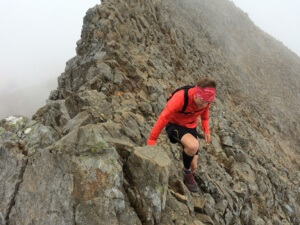 Crib Goch is known as a ‘knife-edge’ ridge, this was the first time I’d walked/scrambled across a ridge of any kind. Within minutes of arriving at the car park we were running & within a couple of km, I was halfway up it thinking ‘This isn’t running!’. During the climb, the weather threatened to come in and cover us, or as they call it here; ‘the cloud’. I was so busy concentrating on the run/walk/scramble, I had forgotten we were actually headed for Snowdon, another first for me! I was very excited but mainly trying to get there without any serious incidents! A running friend, Justin had invited a small group of us to North Wales to explore the Welsh 3000s route (14 mountains in North Wales that are above 3000ft) to help him recce the course as a run. Once the date had finally come, it was just the 2 of us.  I was basically given a 1-to-1 mountain walking multi-day trip with a highly qualified mountaineering instructor / ultra runner who grew up in North Wales. His day job is his business Climb South West so I ask myself -Does he normally charge for this sort of thing? I won’t mention that in case he gets any ideas to charge me for our next run together! So far we had had the mountains to ourselves. It was only once we’d reached Snowdon we actually started to see some other people (through the cloud) who’d taken either the mountain railway or the main tourist track. It was great to reach the top and see the view, or just to reach the top. Off the other side & we drop a few hundred metres (possibly) down quite a tricky path where we meet some hikers (why did they come this way?!) “Are we nearly at the top?”, ” yeah not far” Justin says. Hmm. We then drop a bit further before approaching another ridge, Lliwedd. This has another sheer drop on 1 side, luckily it was too misty to see it and too windy to even attempt a walk along the top. A few miles later and there is some relief at coming back down, knowing there is no more scrambling to do for today and soon there will be food. The last part of the run includes running on tarmac & a stone path around a lake. More nice views including the mountain rescue helicopter circling, we found out later it was attempting to get higher but was struggling with the thick cloud. The final part of the run back to the car saw me running with the cows again, cows really didn’t bother me now after I felt like I’d just conquered the world! 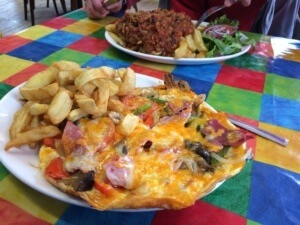 We then headed to the refuelling station in Llanberis – Pete’s Eats! I’m not saying this lightly, this is one of the best places I have ever been for food, although the hunger after 3 hours in the mountains may have swayed my judgement a little! The quality of the food, the pint mugs of tea, the portion size, the staff, the prices, the relaxed feel of the café; the maps, books, pictures, they even had a shower! The bunkhouse – After a long day of driving and running, climbing etc, it was time to get our stuff in the accommodation and meet the hosts. Ben’s Bunkhouse is a mini hostel that sleeps 18 and has all the facilities you need to cook, eat, dry your clothes; even better when only 2 people are staying! It was warm, comfortable and just what I needed to shelter from the local weather system! 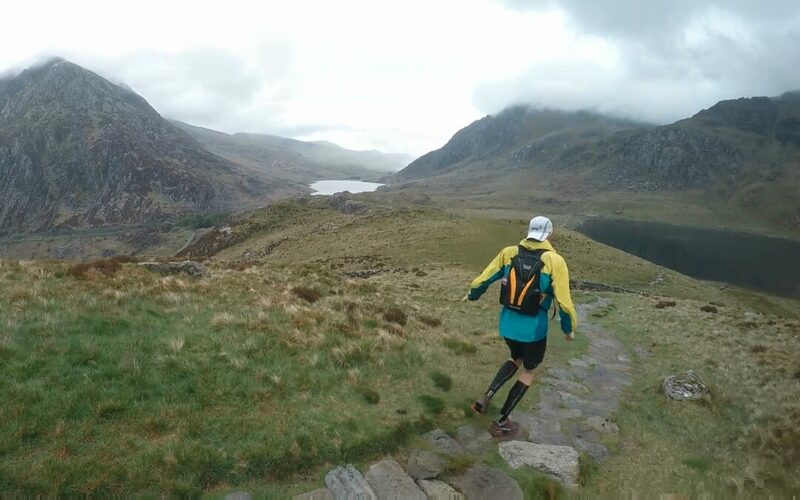 Not content with just 1 run, we decided to head out in the car & visit the local slate quarry- not part of the Welsh 3000s and technically not allowed into parts of it but still a good place to find some elevation. The slate quarry was something else! We park up, grab the head torches, we run, up a hill of course, which soon turns into a walk, and then we negotiate a way into the quarry, as it’s fenced off “This is cool right Justin?”, “Yeah fine” he replied. Just look at this slope! 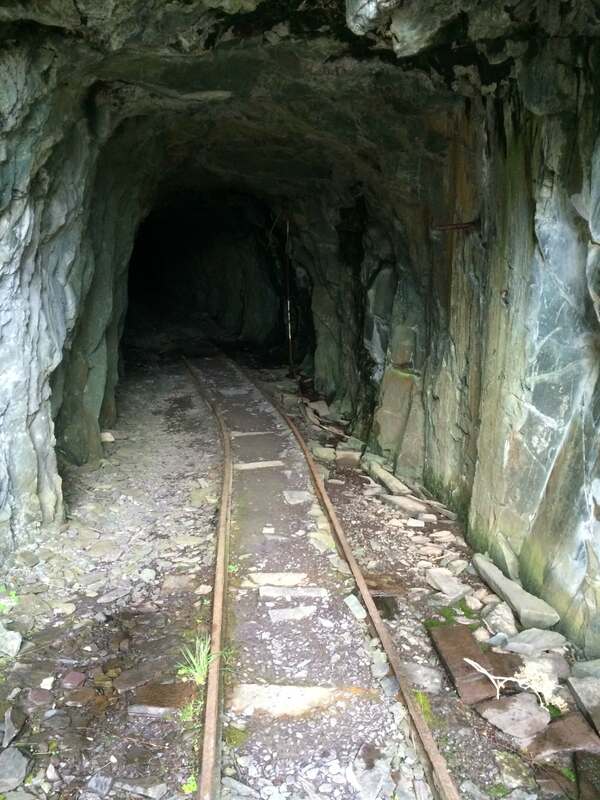 Probably used to transport men or slate up and/or down the height of the quarry. After getting to the top of the 30-40% gradient, we took in the view and found a path to get back on as the light was fading. I am informed that some of the downhills we used to get back are used for a vertical kilometre race (1000m climb in a running event). It was a great feeling running downhill as fast as I could, even with very tired legs, it made for some great video footage. As the light faded further, we reached the last mile or so, and the rain came in. One good thing about visiting Llanberris out of season is there was plenty of parking in the village and barely anyone around for company on the mountains. As we came hurtling down the hill, back to normality, there wasn’t even anyone around to give us strange looks! Pete’s Eats was in our minds but unfortunately it was closed, just a couple of beers from the local spar (Brains SA, what else?) then and more Nutella sandwiches, I could still taste the omelette. Another day, another scramble, & more sunshine! I’ve been told since this trip by a few people that Tryfan is their favourite mountain, & after today I think it’s mine too. The path starts just off the road by a lake, and as soon as you start on the path you are walking (not running). You can see the shape of it from the road & it goes up diagonally to the top! This scramble was more challenging than the day before but at least it didn’t have a drop on both sides, this gave me a tiny bit more confidence to just keep going, because once you’re halfway up, it is not really an option to head back down the way you came! About halfway up and we reach ‘The cannon’, a pointy boulder which looks out to the valley in 3 directions and on this sunny morning it was quite a sight, from these pictures though, you can tell who was the more brave! Kids cl imb this mountain right? Yeah all the time! So as we reached the top, the famous Adam & Eve came into view, I had heard about this double trig point before and the thing to do once at the summit is to jump from one to the other. There are many pictures of it in Pete’s Eats; I thought about it and unfortunately it was the one thing I really bottled out of all week, maybe next time! After about 10 minutes of setting up shots and taking photos, surprise surprise, the bad weather came in, we quickly scoffed our Nutella sandwiches, bananas and a few swigs of our drinks before trying to find a path back down. We eventually found one, picking up a lost runner on our way. He followed us down and soon disappeared off up the next hill when we said we were stopping for another fuel stop. On our approach to the next hill, we could see the clouds cascading upwards and over the edge of a cliff, into the higher valley, it is a local spot known as Devil’s Kitchen in the guide books but I’m told, the original translation was something very different! This incredible downhill run rounded off a nice morning of running which included the first 10k being covered in 2 hours 59 minutes! Is that allowed on Strava as a run?! Later that afternoon, Justin had promised an afternoon of climbing / exploring. I was a little tentative about the climbing but figured I’d just go with it, back to the quarry it is then. 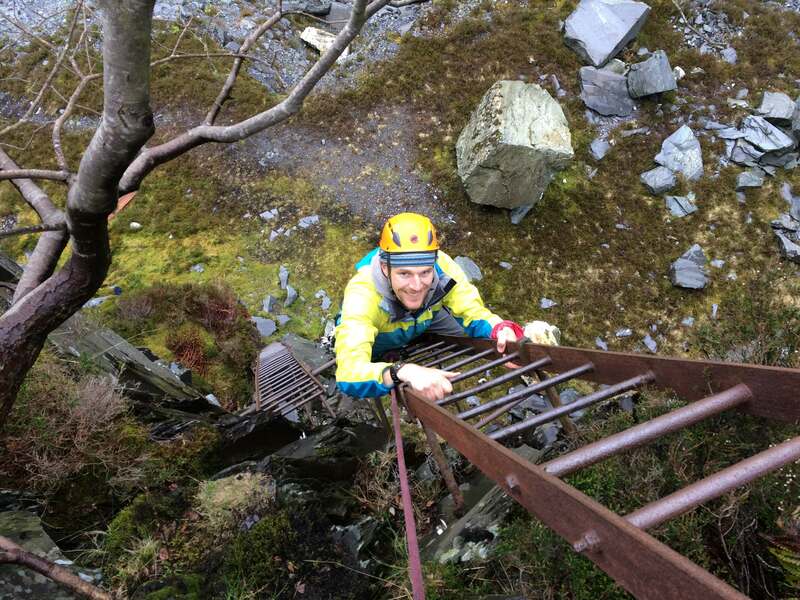 This has to be the most weird and wonderful part of the trip, I ran up a good number of mountains on this trip and can really apprec iate the beauty of the places I’ve seen, but we were again back in the mysterious slate quarry in our normal clothes, for a bit of climbing. We had a set of instructions / guide from a blog which is included below, climbing a chain, abseiling in the quarry, going through tunnels, climbing up ladders! The ladders used by the quarrymen were still there, bolted into the rock, almost 50 years after the quarry had been abandoned. Luckily for me Justin is not completely stupid and used his climbing equipment; ropes, helmets, clips etc. to get us up a few ladders. The quarry is set up with different layers / ledges where the men worked on various depths of the quarry, there are remnants of train tracks, pipes, and fully built huts, some of which look like a nice spot for lunch! Day 3 was the best day for running and a good day for an adventure. By the end of it we had run 20 miles, picked off another 4 of the 14 peaks, scrambled out of a valley, drunk river water and seen more sheep than I would normally see in a year in Devon! Justin had a new plan for us, a route he’d never done before – “It’ll be all right” as he loves to say to ease my worries (to shut me up). We parked up at a sea front car park, overlooking Anglesey and started our run ‘from sea level to summit’. I was quite tired from the cumulative mileage and back to back days of adrenalin-filled hill climbs and scrambles but off we went. Within 2 minutes we had to stop our watches; there was a bull and a cow in the path. I’ve been getting more accepting of cows recently but even Justin was looking to hop over the hedge into a field to avoid these two love birds! So a slightly slow start to our quest for heights but we were soon off again and walking up a super-steep road, just to add another hurdle, this road was closed off as a building site, ‘no access yada yada’, after the quarry adventure, this was not about to stop us. We eventually got to an off road path which resembled some of the rolling moorland we’re used to seeing closer to home on Dartmoor, only with huge mountains as a backdrop. As we rambled past the gorse and few hundred sheep, the valley we were aiming for came into view. After a couple of tentative river crossings, we approached the valley on a solid narrow track; it appeared well walked but we were the only ones for miles around. It seemed the only way out was going straight up over the rocks. I was a well-seasoned scrambler by now but was still a little nervous to be going ‘up there’. As with a lot of scrambling, it looks a lot worse from a distance than it actually is when you get up close to it. The only way to describe this valley is like a 3-sided box with a river running down the middle. The scramble was manageable & we were soon looking back at where we had come from to another stunning view, I still wasn’t getting bored of the scenery up there. Now heading along the top of the ridge we had some fairly easy running, so took some cool video footage (link below). It was a relief to see we would be now running at a more familiar pace of 8,9,10 minute miling rather than the 30,40,50 min/pace I’d been getting used to! A quick check for our man with the map says we go that way, more sheep and a few hikers and we eventually hit a sweet bit of downhill. Sweet referring to the perfect gradient for FAST downhill running. I clocked 5:30 pace for almost a mile and Justin was running away from me! A few more jelly beans and we head for home. I am getting tired at this point, 16 miles and nearly 4 hours in (and 3 days! ), all I can think of is the coffee back in the van and the seaside we are fast approaching! Day 3 came in at 20.2 miles and 4 hours something; a little scrambling for good measure but a real good day for the runner. We picked up another 4 3000ft peaks that day, 2 of which were less than a mile apart. I guess this is how people can complete the Welsh 3000s in such a short time, lucky for us we were going for a record that day! So having just run the Dartmoor Discovery, (32 miles on tarmac – much harder!) 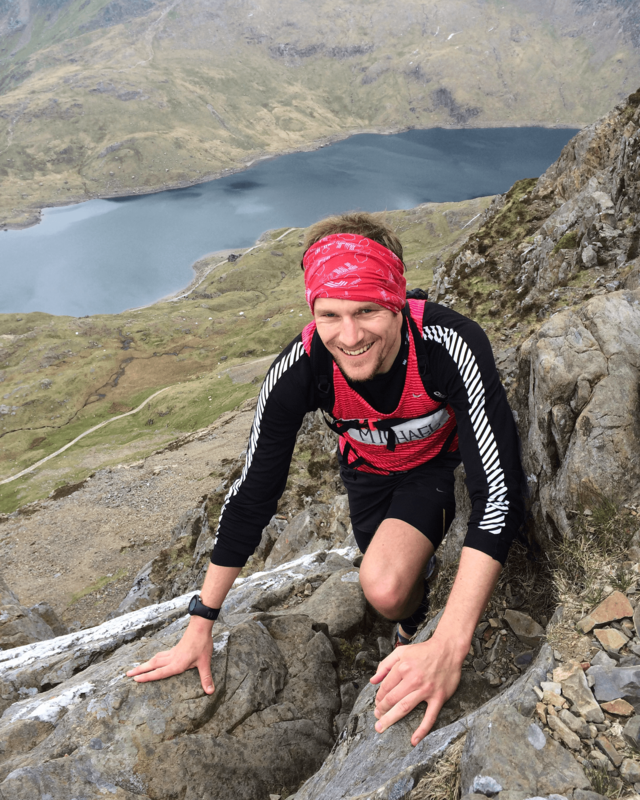 I look ahead to Welsh 3000s in Oct; Justin is organising an event in early Oct which uses some of the same paths we ran including Crib Goch ridge. 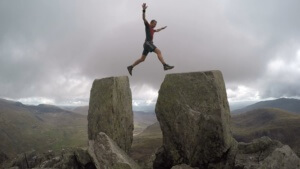 The challenge is a 30 mile route, hitting the summits of all 14 Welsh 3000s in 2 days, with a choice of walking or running. I’m informed that it is possible to complete it in less than 1 day (if you’re in a hurry!) I’ve signed up to more scary heights and breath-taking views. 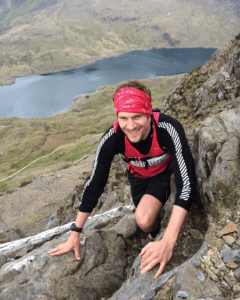 I am looking forward to the challenge of completing the route with a little more confidence having seen most of it before, and going back to Pete’s Eats for a Monster Omelette or 2! A short video from the weekend.